The Chalakudy River that originates in the Anamudi region of Western Ghats flows into the forests of Vazhachaal and forms two waterfalls at a gap of 5-6kms around the Athirappilly region making it a hot spot for tourists. The river flows over the rocks turbulently and through slopes creating a mystic scene at the Vazhachaal and further it flows for about 5kms before converging and getting turbulent again to take the deep plunge at Athirappilly. Accompanied to these two are the lesser known Charpa falls of a tributary at about 3kms from Athirappilly where water splashed onto the road at peak season. We got set early morning after a refreshing bath in the Chalakudy River further down the waterfalls and an amazing breakfast served at tour home stay. 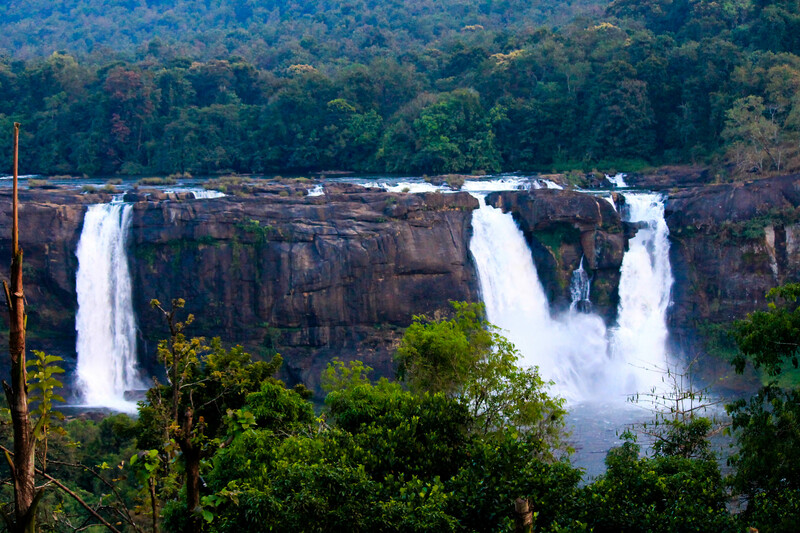 An entrance ticket of Rs.10 entitles you to enter both Athirappilly and Vazhachaal falls area. After entering the gate at Athirappilly, we walked further through the forest land which now had few shops on either side that sold forest products and other stuff like soft drinks & water. A small walk of about half a kilometer takes you to the view-point from where the top of the falls could be seen. To reach the bottom of the falls, we have to take a stairway that goes down the cliff. It is a brisk down stroll for another 10 minutes and the rest is forgotten at the magnificent sight from that point. The river broadens at this cliff and plunges down into the valley along the black rocks making it a spectacular sight. The width of the falls makes it look like a miniature version of Niagara and aptly, Athirappilly is called the Niagara of India. But thanks to the bad monsoon this year, the falls had only average amount of water. We spent some time at the bottom of the falls that has been a favorite of movie makers. As the time passed by, it started getting hotter and more crowds flowed in given the holiday of Gandhi Jayanthi. We took a final look before we started our climb back to the gate. 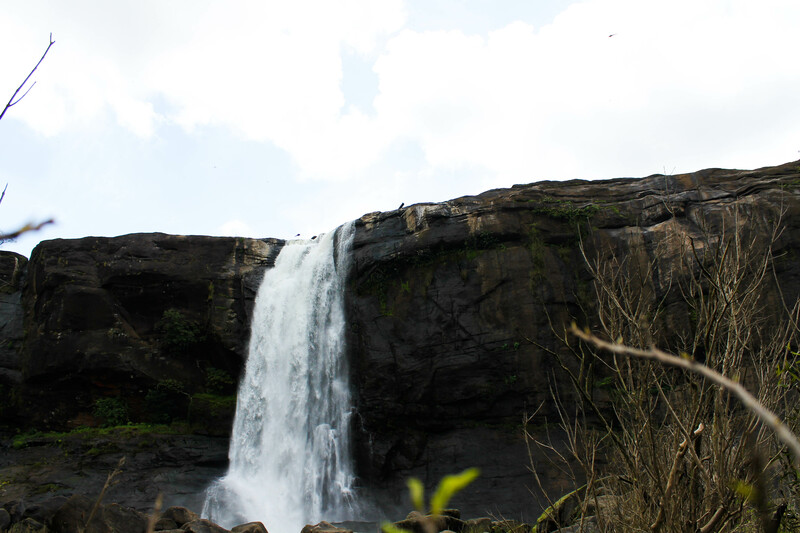 We made a quick visit to the Vazhachaal and Charpa falls but both were not as pleasing as Athirappilly. Vazhachaal did not have a proper view-point as the recently grown trees had covered the place entirely. Our final leg of the drive began at around 11.30AM from Athirappilly. We had to drop the plans of driving thorough Ooty now since the Cauvery protest was fierce around Mysore road. So we chose to go via the same road as we came, Salem and Hosur. We drove past the towns of Palakkad and crossed over to Coimbatore at Valayar check post. The hills were back again in the landscape around us. In few hours, the climate became intolerably humid again. Finally we opted for a pit stop at Saravana’s few kilometers past Coimbatore for a stomach filling lunch. Rest of the journey was not eventful but the drive through the six-lane roads between Coimbatore – Erode –Salem and then the stretch between Salem and Hosur was like a cruise. Cheese smooth roads and music were apt curtains for a long road trip of 1800kms! After 4days and 1800 kms, traversing hills, plains, tea plantations, border gates, waterfalls and wildlife, we were back in the Garden city of India, Bangalore. Nice writing bro. I am also thinking about an article based on athirappilly.